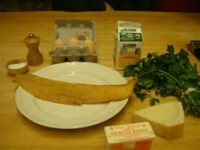 Just in case, you have absolutely nothing to serve for Sunday night supper with your neighbors (like me last night with Holly, Gary, and Cameron Saybah); here is a really delicious Irish traditional recipe for a souffleed omelette with finnan haddie (smoked haddock). It’s good and good for you! To prepare the fish, put it in a small saucepan covered with milk. Simmer gently until it is cooked enough to separate into flakes, about 10 minutes. Drain. In the cleaned out pan, heat the 2 Tbs. butter with 2 Tbs. cream and toss in the flaked fish. Turn off the heat. Preheat the broiler. In a bowl beat the egg yolks with 2 more Tbs. cream and season with salt and pepper. Stir in the haddock with half the Parmesan. 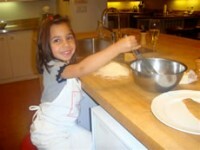 In a clean bowl, beat the egg whites with a few grains of salt until stiff but not dry. 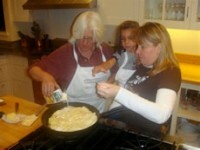 Gently fold the whites in the yolk mixture. In a large non-stick pan, heat 2 more Tbs. butter until bubbly. 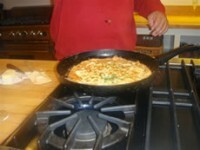 Pour the mixture into the pan gently and cook over medium heat until the base of the omelette is golden. 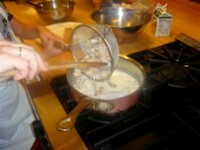 Spoon the remaining cream over the top and sprinkle with the rest of the grated Parmesan. Put under the boiler until the top is golden ands bubbly. 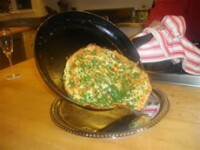 Slide onto a warmed dish, sprinkle with minced parsley and serve immediately accompanied by a green salad.